Three lawyers sharing one upper floor office. And empty office below them, and no main receptionist with a fancy headset to guide clients to their attorney. Enter True Northe. 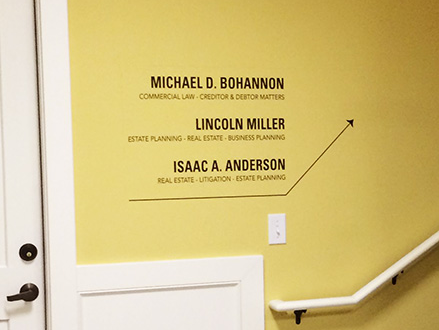 I created a variety of signs to point clients in the right direction, in this case, UP. There are signs for the window, the elevator and staircase, and signs up in the office itself. No one can get lost.